Did my own Borderlands 2 Skill tree. Will be playing Gunzerker as my main character and I'm gonna boost all his Gunzerking skills to be the ultimate dual-wielder! 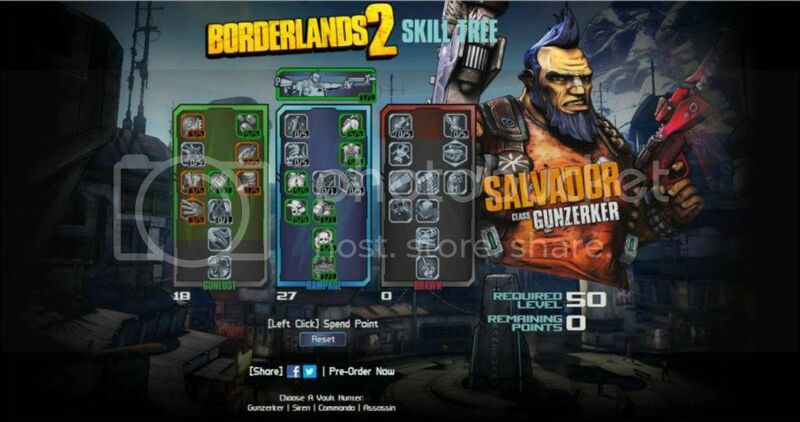 Some of the skills in the centre skill tree focus on reducing the cooldown to use the Gunzerking skill as well as prolonging it while it's activated. I might consider tweaking it a bit when the game is out but I seem pretty satisfied with how it looks at the moment. Do try out the Skill Tree Calculator to check out the skills available for each class and plan out your skill tree before the game is released.